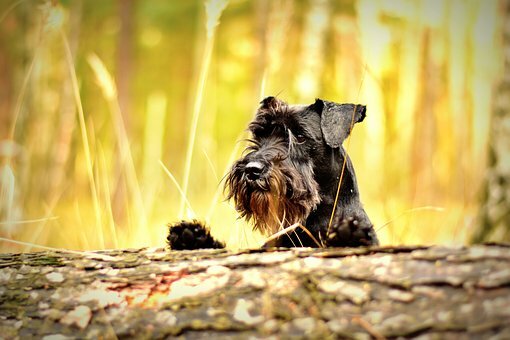 Miniature Schnauzers are very spirited, friendly and intelligent. They are very much a companion dog and will follow you around and will want to be with you at all times. They are quite active and need plenty of mental and physical stimulation, including exercise and interesting activities to keep them from getting bored. The make a good watch dog and always look out for their family. When properly socialized they are very polite to strangers, make a good family pet and get along well with other pets in the household. They are eager to please, but do have a stubborn streak. This makes them obedient, but they can sometimes be difficult to train. They are a very vocal breed, and do like to bark. Miniature Schnauzers are still ingrained with their chasing and digging instincts, so they do need to be supervised when outside. They are a low-shedding breed. However, their coat does require frequent grooming, clipping and upkeep. Miniature Schnauzers are more prone than other breeds for the development of bladder stones. Cataracts are an opacity in the lens of a the dog’s eye, causing them to have blurry vision. Glaucoma occurs when the fluid produced in the eye can not be properly drained due to a blockage. This build up of fluid cause an increase of eye pressure and eventually damages the internal structure of the eye.